I really didn't enjoy this book. I had to read it for college, so I probably wouldn't have picked it up if I saw it in a bookshop but I persevered and finished it. When I first opened the book I noticed that the font was almost in bold. This is probably just because of the copy I bought but it was still irritating. Secondly, the writing style is very annoying because the author doesn't use speech marks. Instead they indent using dashes when someone is speaking; this I found very frustrating although unique... Lastly, there were no chapters which I personally disliked because I always ended up having to stop at random places. The story line was very slow paced and nothing really happened. There was no climax and all we heard about was Paddy's adventures with his friends. I have to admit some of these stories and adventures were entertaining but in general they were all pretty boring. I did like how it was written in the perspective of a child. 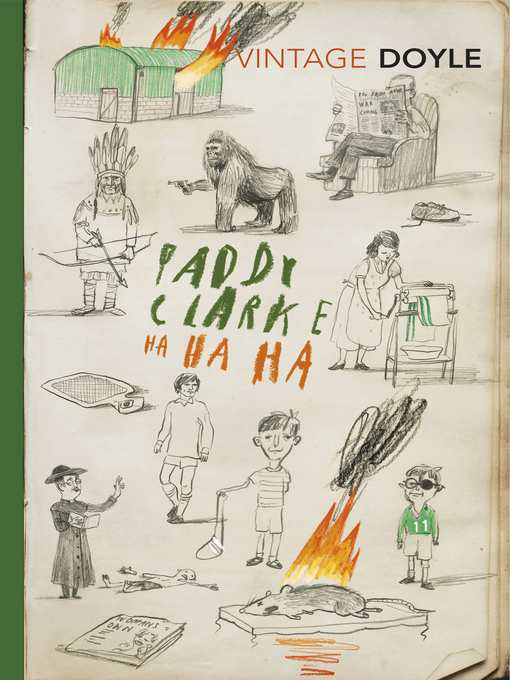 This is quite difficult to do and I think the author successfully managed to create Paddy's voice in a captivating manner. Not many novels are written in younger children's voices so I do enjoy novels where this has been done well. Overall I wouldn't recommend this book. It's good if you want to read something that doesn't have a set plot and is very casual but there are more things I disliked than liked. I think I will probably avoid this book, though I am curious as to what the "ha ha ha" is referencing to now. That cover is pretty interesting though. Does it tie in with the story? I had to read a book for school without quotation marks this year, and it was the most frustrating thing. I know it's said to make the writing more fluid, but honestly it made it harder for me because I had to pause to make sense of who was talking and such. Everything in the cover is part of the story yes. I purchased a copy with a different cover but I wish I had got this one because it's more creative and I like the colours and cartoon aspect. Oh, this doesn't seem like the kind of book I would read myself. It's a shame you couldn't like it. And the idea of the formatting being so bizzare - no speech marks! - would definitely get on my nerves. I was curious about one set in Ireland because I have read another book that was great and set there (A Cry From the Deep, Diana Stevan) but I think I will give this one a miss. Yeah I really don't recommend it ahaaa. The formatting was the main thing that irritated me but the story line just didn't have anything to it either :( It's a shame because I half of my English exam is based on this book!